Lights in the sky. We've all seen them, but nothing like people saw over the skies of Lubbock, Texas, in 1951. Over a span of two weeks, hundreds of people reported seeing blue/green lights flying in V-formation in the dark skies. Dubbed "The Lubbock Lights," the sightings have since gone down in history as one of the definitive UFO events of the modern era. History's Project Blue Book tackles that event in this week's episode, weaving Dr. J. Allen Hynek (Aidan Gillen) and Captain Quinn's (Michael Malarkey) own fledgling investigations into the lore. In this week's Project Blue Book: The Official Podcast episode, SYFY WIRE's Tara Bennett welcomes back showrunner/executive producer Sean Jablonski, and the mysterious Blue Book Generals, Michael Harney (General Valentine) and Neal McDonough (General Harding), make their podcast debut. We promise some intriguing intel about making the episode, what the Generals are up to, and just who the "top shelf" guy in the room is. We'd love to hear from you if you have any questions for the showrunners. Leave them below in the comments section, or let Tara know on Twitter at @TaraDBennett. 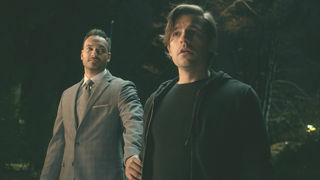 New episodes of Project Blue Book air Tuesday nights at 10PM ET/9 CT. For more information on the series and cases explored, check out HISTORY'S Project Blue Book.